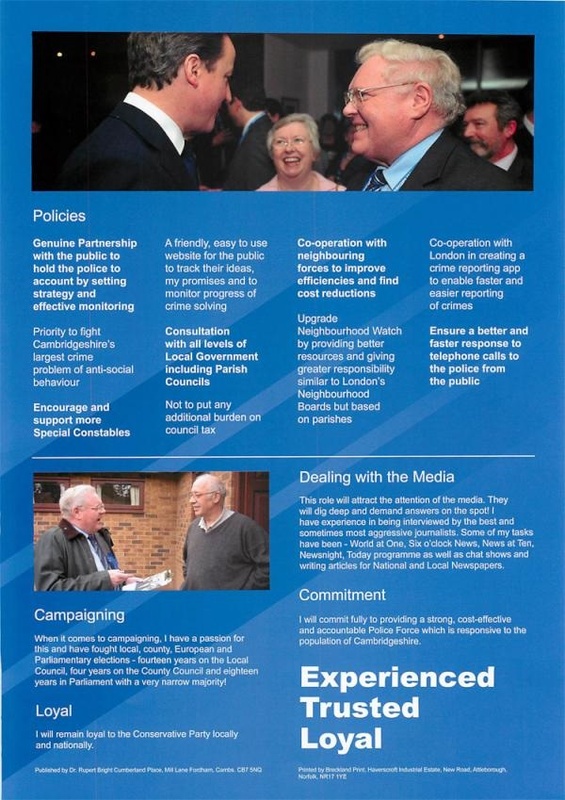 On the evening of Friday the 7th of September 2012 Cambridgeshire Conservatives held an event at which they had a second go at selecting a candidate for the role of Police and Crime Commissioner. They were trying again as the person they had previously selected in a postal ballot of their membership, John Pye decided to step down. Mr Bright has listed ten policies on his webpage (as it’s just one page I don’t think I ought call it a website). I didn’t find this particularly easy to parse. I think what he’s saying is that a key way of holding the police to account is to monitor the police’s performance against strategies which have been set. I don’t think anyone would disagree with that. This is a principle which I would like to see deployed at all levels from local priority setting meetings, through the district Community Safety Partnerships, to force wide policing plan. I think there’s a need, and opportunity, for the Police and Crime Commissioner to look beyond the police; they could, and in my view should, take a role in leading all police and crime related bodies ensuring including probation, the courts, elements of local councils are working in support of the strategies set. There is also a role for Commissioners to hold national bodies, such as the National Crime Agency when it comes into being, to account and to ensure it is supporting the work of the local police and justice sector. In practice, to genuinely involve the public, at the level of being in partnership with the commissioner will require openness and transparency. Strategic priorities at all levels will need to be quantitatively set and the information needed to assess if they they are taking effect will need to be openly and pro-actively published. As well as openly publishing information and being open to input from all with an interest I think that working with elected representatives, district, county and Peterborough City Councillors, is a valuable and valid way of a commissioner engaging with the public. I would like to see a commissioner use councillors on the Police and Crime Panel to assist in monitoring the performance of the police, both against strategies set and generally monitoring performance and looking into concerns raised by the public, inspectorate, custody visitors, and others. I disagree strongly with this priority. I have attended very many public meetings on policing in Cambridgeshire and almost invariably when members of the public or their elected representatives use the term “anti-social behaviour” they are referring to things which were otherwise criminal before the New Labour Anti-Social Behaviour laws came in. I do not think “anti-social behaviour” is a useful term; public clamour for the police to act on it leads to police stopping youths gathering, stopping youths playing football. The police and public seeking action both use the term “anti-social behaviour” even for violent assaults, drug dealing and other serious crime, I don’t think this is helpful and ought be encouraged. When pushed to explain why they are complaining about, or even reporting to the police, instances of youths gathering, I have on a couple of occasions heard people articulate that they want an assurance that if something did happen then the police are able to respond. I think that this kind of assurance does need to be given, but not at the expense of criminalising perfectly reasonable behaviours. I think a key element of providing that assurance is for the police to answer their phones promptly, an area where Cambridgeshire Police are currently, and inexcusably, failing. Another problem is the expansion of the number of crimes dealt with via ASB law, when other laws would be more appropriate. An example is the way dangerous, careless and speeding drivers are now often dealt with. I agree with this. I think Special Constables, holding as they do the full powers of a police constable, are incredibly valuable, more so than PCSOs. Volunteering in this way, as a Special Constable, and in many other ways too should be encouraged and supported. I don’t think a commissioner’s promises website should be the same as one providing updates on solving crime. I think getting the police’s internal systems online and modernising the force’s IT enabling things such as obtaining information on the status of a crime investigation to be done online is necessary, but ought be quite separate from a commissioner’s web presence. There is a need to separate the commissioner from the police force and not treat them as Mr Bright appears to plan to, as one and the same. In terms of submitting ideas – at the local level I would like to see every local police priority setting meeting have an online presence; such as a Facebook group, a ShapeYourPlace website or a local forum site where suggestions can be made asynchronously by those unable or unwilling to attend a priority setting meeting. The commissioner, and local community safety partnerships should also have interactive websites enabling open public debate and deliberation. Yes, but I disagree with Mr Bright’s focus on Parish Councils, they are often not the strongest elements of our democracy. Many town/parish level councils don’t operate very transparently and they are particularly prone to having uncontested elections or councillors appointed due to vacant seats and uncontested elections. I would like to see local district / county / Peterborough City councillors given responsibility for deciding to what degree to, and how to, involve their local parish councils. Mr Bright has been banging on about Parish Councils in a radio interview this morning; they are clearly, along with “Neighbourhood Watch” a strong element of his campaign, I’m concerned though that, to put it politely, they sometimes attract the more outlandish characters, and feed Neighbourhood Watch’s input in, along with input from other sources, to district and county councillors at priority setting meetings where the police would be held to account. I support the idea of keeping the state as small as possible. I think I can spend my money better than the state can, and taxes ought only be spent on things individuals can’t practically do themselves – like building roads or providing a police force. I think that saying there will be no increase in the police element of council tax in the first year is a reasonable manifesto to stand on; however this ought be accompanied by a statement by saying how the budget will be balanced. The Chief Constable has already made clear he will be pushing for an increase in the council tax precept, saying without it he will be forced to cancel recruitment and officer numbers will drop. I think saying he will not put any additional burden on council tax isn’t something which ought be promising now, for years beyond the first, he simply doesn’t know what the future holds. Clearly collaborations are a way of saving significant amounts of money. Much of this work has already been put in train by the current Police Authorities, it is no longer an area of easy savings. Notably Bright has not said “continue the current collaborations with Bedfordshire and Hertfordshire”. If collaborations relate to online back office functions there is no need for them to be with neighbouring forces. I think there is currently a lot of waste, duplication, and lack of cohesiveness surrounding Neighbourhood Watch and local groups which set police priorities and hold the police to account for their performance against them. I would like to see democracy at the heart of the system, with local councillors setting priorities and holding the police to account after having listened to the views of the public. I think all information which is given to Neighbourhood Watch groups ought be made public, via systems such as eCops, Twitter, Facebook and other routes; there is no need to continue to maintain separate infrastructure and staff to support neighbourhood watch and local police priority setting committees – in East Cambridge recently we had a new Neighbourhood Watch Group on Whitehill Close attend the East Area Committee where their local police priorities are democratically set, saying they went a year as a group without being made aware of the committee. I think all local police consultative activity be it in schools, crime buses, police surgeries etc. ought feed into the elected councillors at the priority setting meetings. Yes, it should be possible to report certain types of crime online (a phone compatible website would probably be easier to maintain than a series of apps for different devices). I’m very cautious about creating confusion though; there is already immense confusion over things such as the threshold for reporting a matter to the police, what to report to the police and what to report to the council, and for example if reporting something by email, or by phone direct to a specific officer, is as effective at getting the matter recorded as dialling 101. I would also be concerned about the reporting of matters which warrant a quick police response online; I think the phone is the best technology for many reports of crimes, as it allows the caller to be quickly questioned to find out the required information. For some reports though, where the main aim of the caller is to simply report something to obtain a crime number for insurance purposes, or to ensure something registers on the police’s statistics so they can determine if there is a trend, online reporting is clearly the way to go. Absolutely. (Read more about my lobbying and campaigning for Cambridgeshire police to answer their phones). This is something a commissioner should ensure gets sorted out on before they go to sleep on the day of their election. Providing strategic direction not just for the police, but for the work of the courts, prison and probation services, local councils and other bodies with an impact on policing, crime and justice matters in the area; including schools and health service providers. Safety, including road safety and injuries. In my view keeping people safe is one of the key roles of the police, and a commissioner’s effectiveness can be judged by the number and severity of crime, and roads, related injuries. Drugs, despite their huge impact both through crime such as burglaries, and on the health of those taking drugs and committing related crimes. There are no specific Cambridgeshire related priorities; nothing on preparedness for eg. flooding, nothing on what if anything he will do to sort out the unreliable and dangerous A14, and no mention of cycling. 11 November 1983 During consideration of a Bill designed to regulate video recordings Mr Bright expressed concern that banning certain material could lead to an unregulated black market. 25 April 1986 Mr Bright raised the case of a constituent’s death, following which the family had to mount a private prosecution for manslaughter in order to obtain justice, highlighting problems with the state’s decision making process in determining if to prosecute or not. 9 March 1990 and 27 April 1990 – Acid House Raves Bill – Mr Bright spoke in support of higher fines for rave organisers breaching licensing laws. These were good quality contributions, but it hardly looks like the record of a man who is passionate about policing. For comparison Cambridge’s current MP, Julian Huppert has made a speech containing the word “Police” 49 times in debates in the House of Commons in just over two years whereas in Mr Bright’s 18 years he managed 16 times. Mr Bright said less on the police in thirteen years as an MP than Mr Huppert has managed in his first two. I had never watched a blue movie, but I must admit that when I was in Sweden I was led astray by some Swedish politicians and I did not enjoy the experience at all. Whereas the previous party selection process involved 746 members Graham Bright was selected by just “over a hundred” party members at the hustings event, with those who could not attend in person being disenfranchised. South Cambridgeshire Conservatives have stated the numbers of votes cast for each candidate would not be revealed in line with “party tradition”. A couple of months earlier though the same website carried the breakdown of “votes/points” for each candidate in the initial selection process. … I didn’t vote for him. The reason was that he was too dry, I didn’t detect any passion for the role. That’s the noteworthy quote; if it’s piqued your interest for its context see Cllr Tierney’s article. Peterborough Cllr now backing me. Says minority took part in latest Tory selection had to go to second ballot. Bright not a pop choice. This entry was tagged Conservatives, Graham Bright, Police, Police and Crime Commissioners on September 10, 2012 by Richard Taylor. Sir Graham’s hustings performance was a marked improvement on the one I saw previously. He won fair and square and I have no doubt he’d be a great PCC if elected. The mans not for Tierney-ing! I just had the idea of sending a link to this article to Mr Bright and inviting him to comment. However he has *no contact information* either on his website (not even on the downloadable leaflet). If he doesn’t make himself contactable as a candidate why would we expect any better if he got in. So much for a partnership with the public. This is from April 2009 and is a leaflet promoting his candidature for chairman of the National Convention of the Conservative Party (whatever that is). Interestingly it also uses three of the same photos of Mr Bright which he has used in the materials for his current election. This makes me wonder how old the photos of him are. (When going into a council meeting it’s hard to recognise many elected representatives from the photos they publish). The leaflet states Mr Bright was “active in the Party since the age of 15″. 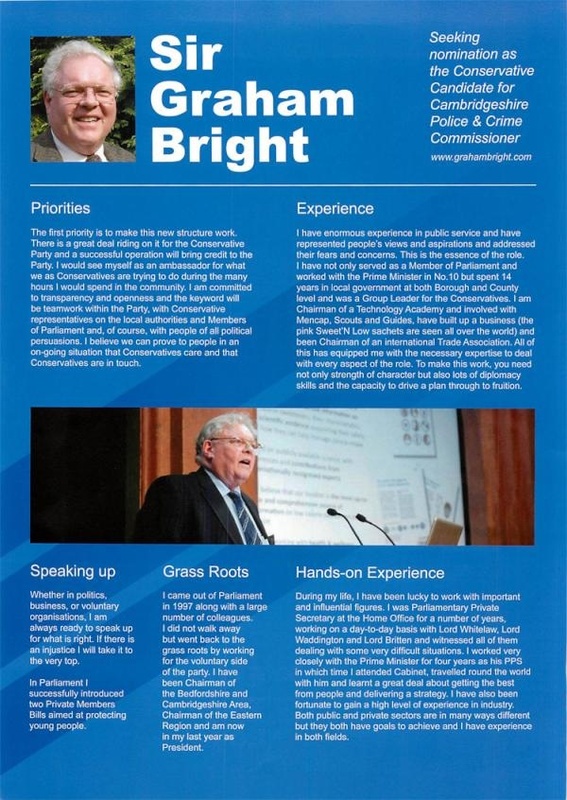 The leaflet prompted me to improve by article above to note Bright was an MP for 18 years (I’d said “about a decade and a half) he represented Luton East between 1979 and 1983 and following boundary changes, Luton South from 1983 until being booted out by the electorate in 1997. The leaflet states Bright is the chairman of Dietary Foods Ltd., a specialist food products company which he set up in the 1970s. (Company No. 00807107). The leaflet states Bright’s wife, Valerie, is a magistrate. If Mr Bright is to freeze the precept, how will he balance the budget? How much does Mr Bright plan to spend on running his office as commissioner? Does Mr Bright think PCSOs provide value for money when compared to a PC? Would Mr Bright allow Cambridgeshire to join the ranks of those parts of the country where TASER weapons are routinely carried by the police? I’ve written an article commenting on some of the policies you’ve published in conjunction with your candidature for Cambridgeshire’s Police and Crime Commissioner. I’d like to invite you to respond to some of the points raised in public using the comments feature on my site. Thank you for your informative page on Sir Graham Bright. Cambridge City Conservatives according to their web site haven’t yet picked up on the fact that John Pye is no longer their candidate. So currently they are campaigning for the wrong man. I am surprised at the wholesome support that Sir Graham has attracted from the losing candidates. My thoughts on him as a candidate are that his policies have little substance. There is no evidence that he has any prior knowledge of policing or the politics of policing. He has in his first statements shown that his thinking does not go beyond lazy media stereotyping of youth. He is pandering to the red top led fears of an aged rural community, and with no objective basis claims that “folk are scared to leave their homes”. Your assessment on his policy on Anti-Social behaviour is spot on, but I suspect that confusing real crimes with young people gathering in parks is deliberate. Working up the fears of voters rather than bothering to understand and address the complexities of policing justly in a modern society is a much easier gig. I too searched the web for some means of communicating with him. I haven’t been able to find a contact detail of any sort. Does he actually live in Cambridgeshire? It does not appear that consultation, or communication with people outside his closed circle is really on his agenda. His intention to use Parish Councils as his primary consultative base is laughable, not just for the reasons you list but they don’t exist in Cambridge, and I am pretty sure they don’t exist in Peterborough. This disenfranchises roughly half of his constituents and pretty much all of his city constituents. As for the policy on Neighborhood Watch – these are hardly representative organisations. It would appear that this Septuagenarian has found a neat way to enhance his MP’s pension. I cannot believe that this man will provide the inspirational drive that will be required to push forward this new post in a positive way. I suspect G&T’s all round at police HQ. Round up a few kids Sargent and keep the old buffer happy! Paul, you are quite wrong if you think Graham’s selection will have caused drinks all round at police HQ: he absolutely gets the need to hold the chief constable to account. I suspect this is more than can be said for Mr Murphy. I think G&T’s all round at Police HQ is what Paul thinks will be the order of the day if Bright is elected. I’ve not had any response, not even an acknowledgement or bounce message, to my email to Mr Bright. It is quite obvious to anyone with knowledge of the world around them, preventing (young in particular) people entering the justice system is the key to msking better use of resources. I hae seen my local Conservative Council cut funding to prevention work including drugs prevention for young people. The did this 9 months ago. We have now had an increase of admissions of teenagers into hospital and a rise in crime. Out of touch politicians with the wrong policies. We need to listen to those who know about the issues and if that means a change in approach then politicians should change policy direction. Perhaps Andrew Bower you can help us by providing the contact details for Sir Graham Bright. He may get the need to keep the Chief Constable to account, but he does not get the need to be accountable to the constituents he asks to elect him. I look forward to his address to the non-existant Parish Councils of Cambridge. In searching again for contact details for Sir Graham Bright I came across an interesting debate on Sir Grahams suitability for a peerage from Conservative Home in 2009. Whilst there was clearly support from fellow party members for the time he put into Eastern Area Conservative politics. In considering Sir Graham Bright the following assessment by a contributor is instructive. There are other similar comments which leaves you rather wondering what were the assets that the local Conservatives saw when they voted for him at their closed hustings. I guess if his constituents are unable to contact him we will never know. Over retirement age, litle or no activity regarding policing, little or no connection with Cambridgeshire. Is this the best the Conservativce party can do? There are many sources online which say Graham Bright was one of the public figures duped to appear on the 1997 TV show “Brass Eye” and warn the public about the dangers of the non-existant drug “cake”. Mr Bright’s contribution was removed from subsequent repeats, and does not appear to be available online. I think that the Area Committees roughly correspond to the Parish Council level in the city (at least that is what early reactions to the Localism Bill indicated IIRC). But there are also some RAs (e.g. Trumpington RA) that also perform a similar function. In other words, there are plenty of opportunities within the city for getting feedback at level equivalent to the PCs. I have a complete set of contact details for Sir Graham. However, I don’t know which he wants to use publicly for this campaign/role so I am reluctant to post just now — but if you do need to contact him then mail me. IMHO, it was his clear articulation of the need to represent the electorate that won him the nomination. And to be fair to the idea of P&CCs as a whole, this is a good reason why it is not a bad idea to have a politician (as opposed to some quangocrat) in the role. In fact, if you take his record in Luton (which most people would mark as natural Labour territory) then it is fairly clear that he does listen to his constituents very carefully (as a Conservative, you simply don’t hold on to that sort of seat if you don’t) — another fact that I think weighed heavily in his favour at the hustings. Mr Ionides is a senior Cambridge Conservative; who at least in the recent past has been responsible for getting people to stand for council seats. I would be very concerned if rather than using area committees of elected councillors as the prime body setting police priorities and holding the police to account for performance in Cambridge we had a Conservative Commissioner giving excess influence to resident’s associations – which are not so robustly democratic and accountable to all residents. I think that there is plenty of scope for listening to the concerns of RAs and PCs without having to give them “excess influence”. After all, it is not unknown for local political cliques to develop even in “robustly democratic” bodies so that their stated positions might not be that representative of the wider population! And of course, at the local level the majority of people do not vote or engage with the local political scene at all, although I would argue that there is still significant value in seeking out their concerns when trying to reach a judgment about local policing needs. In practice this means engaging with a whole range of organisations (and also just knocking on doors etc). In your view what evidence does Sir Graham have that Cambridgeshire residents are too scared to leave their homes? Is this from Parish Councils and Residents associations, or is there some objective analysis that leads him to this conclusion. The short answer is I don’t know, and I can’t find the precise source of your quote, so in terms of the detailed semantics I can’t really comment. I would be slightly surprised if he had said something along the lines that your selection of quotes infers (i.e. that all Cambs residents are too scared to leave their homes); a quick look at the streets would suggest that to be an oversimplification! However, I imagine that he has been talking to people on the doorstep. I have knocked on thousands of doors across the city and south cambs over the years and have certainly encountered a significant number of similar problems. It is mostly, but not exclusively, an issue that affects older people. A typical scenario might be that there is an OAP in social housing surrounded by young families who take a dislike to their elderly neighbour and tease / generally bully the OAP to the point where they cannot face leaving their house/flat. There are also more general cases; e.g. I know a number of older residents in areas close to Cambridge city centre who feel very uncomfortable leaving their home of an evening (particularly on Fridays or Saturdays) because of the general level of boisterousness (bordering on violence) they encounter. This might sound trivial, but in many cases it really lowers the quality of life of the people concerned. Note that these cases are often not that obvious (after all, the person in question is stuck at home, so is more or less invisible to the rest of society) and as a result you are only likely to pick them up through responses to leaflets and/or by going door to door and listening with a sympathetic ear (which, AIUI, is precisely Sir Graham’s preferred MO). Whether you consider such analyses to be objective or subjective is a matter for you. I know that I strive to be as objective as possible but I realise that trust in political processes is at something of a low ebb right now and so that many might be unwilling to believe this. Given that the city and south cambs are relatively affluent (and well-behaved), I can well believe that there are parts of the P&CC constituency where this is even more of an issue than I have encountered. I can’t see how comments can be objective when to illustrate a point, made up examples are used. However, on a different point, I hope this candidate, and the others, remember that Cambridgeshire does not start and finish in the City of Cambridge. Plenty happening in Wisbech and other places in the North of the County. re: objective/subjective I was referring to the analysis of the underlying canvas surveys, not my comments. also, as I hope I made clear, I was commenting on _my_ experiences (after all, Paul did ask about _my_ view) which as I said are concentrated on the city/ south cambs. I am not any sort of official spokesman for Sir Graham; I am sure he is fully aware of the different requirements of P’bro, Fenland (why is it always Wisbeach that is quoted in this context??) etc. Was he one of those MPs who viewed expenses as something in lieu of a higher salary and so thought excessive claims were reasonable? Perhaps he ought release all his expenses claims? What were the circumstances of him losing the role of parliamentary private secretary to Prime Minister John Major? These questions arise from my email inbox which is full of interesting stuff about Mr Bright which is useful background but needs verifying before it can be published. The quote is from the Hunts Post on September 10th. My concern is that police policy will be driven by the elderly’s fear of youthful behaviour rather than any actual criminal behaviour. Being boisterous is not a crime and shouldn’t be criminalised. Perhaps the solution is to be found in the services and support we offer the elderly rather than a blanket condemnation of youths for being on the streets. There is always the danger that headlines such as above creates unnecessary fears. Richard makes this point with regard to Labours Anti-social behaviour policies under Blair. As far as I am concerned I agree that a balance needs to be struck between the needs of younger and older people; I would never support a “blanket condemnation” of younger people (and I would be staggered if this would be the conclusion of any rational consultation). I also agree that this leaves a rather grey area around boisterousness / ASB generally. Yes, these may not be crimes but I don’t think that means that they are irrelevant to policing – surely one of the points of which should be to ensure that all people feel relatively safe in public areas. Of course, you may disagree with this, and e.g. think that people should be allowed to behave however they like within the law and completely ignore the impact of their behaviour on other people (which is to some extent the current position, the law moving to cover more minor offenses to compensate leading to precisely the criminalisation of ASB that you object to). So be it. But I get the impression from some of the comments here that some people simply don’t believe that there is a problem at all (e.g. bob saying that I have made up these cases). That simply flies in the face of my experience around the south part of the county, which is why I felt I had to respond to those who are criticising Sir Graham for articulating these concerns. Two things in reply to John Ionides. I mentioned Wisbech because I live there and see little evidence of investment or interest in it from the County Council. Secondly, I interpreted your phrase – “A typical scenario might be that there is an OAP in social housing surrounded by young families who take a dislike to their elderly neighbour and tease / generally bully the OAP to the point where they cannot face leaving their house/flat.” as a made up example. Your reaction would suggest I am wrong. That is not me denying there are problems, it is me preferring real examples with names, dates and places. On a wider and more important point, I will find it hard to support Graham Bright as it is difficult to believe he is standing for this post other than to supplement his already generous MP pension. There are real problems with policing across the UK and I don’t believe Police Commissioners will solve them, particularly if the people elected do not know the area and have little or no experience in the way the Police operate. The list of candidates for Cambridgeshire is very weak, and none of them seem to have the knowledge or understanding to perform well in the role. I look forward to receiving more information about all the candidates. The Wisbech standard has printed the extract about Mr Bright’s Swedish escapade, and commendably has credited me for drawing their attention to it via this article. Well done Sir Graham Bright – he has now updated his website. And has contact details graham@grahambright.com and a telephone number 01984 211 444. So, presumably he will start to answer his emails. Look forward to his twitter presence too! Why would he have a contact telephone no. in north Devon? I hope this isn’t the area of his residence. delighted to participate in such an exercise. I have no idea why Mr Bright thinks I should be asking questions about his policies, and his past, to other candidates. I also don’t like the controlling tone attempting to set rules for our correspondence. That the response is from Richard Ali is interesting; especially if it is in response to my tweet, as it raises the question of if Graham Bright is personally in control of his Twitter account of if it is in the hands of Richard Ali (@Richard_UK). I note it appears Mr Bright has recently removed the couple of his own videos he had previously posted on his own YouTube channel. I can imagine that it would be possible for parties who felt it would be in their interest to arrange for a great many long lists of questions to be sent to a candidate. It could eat up a great deal of time answering, then clarifying, then arguing with somebody like your good self. I would guess (and I stress, I’m not on the campaign team and this is ONLY a guess) that Sir Graham’s campaign manager response is to make sure that Sir Graham doesn’t simply become an easy target for somebody looking to waste time. Asking you to address your questions to all candidates seems, to me, a reasonable response. After all, his policies are on his website and he will be appearing at a hustings and in public to answer questions. He is not obliged to spend hours answering questions personally to you if he does not wish to do so. You may take the view that he should answer any communication – personally and in depth. But any candidate must choose how best to marshall their limited time. Why not do as suggested and send the questions to everyone? If nothing else, it would make a really interesting comparison article. 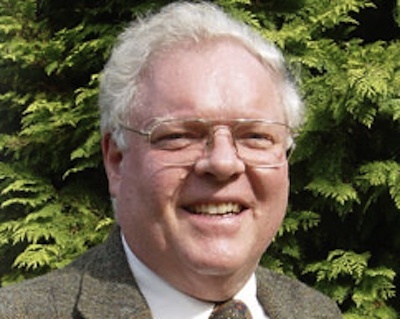 County Councillor Peter Reeve has tweeted saying that Graham Bright’s first action since being selected as the Conservative candidate has been to go off on holiday. Firstly if I don’t get a response now (and I can see on Twitter that Mr Bright is not overwhealmed with people tweeting him) why should I expect to be able to contact him if I want to if he is elected? I am aware (from a now deleted blog post by Nick Hillman who stood in the Cambridge 2010 general election) that some do go in for dirty tricks entering into long time-wasting and fruitless correspondence to waste candidate’s time – but that’s not what I’m doing here. I’m considering who I might vote for (if anyone) and want to know more than has been proactively published. Of course a candidate can ignore people if they want to; ideally that might perhaps cost them some votes, but I suspect many votes might assume the “Conservative” next to his name means he has been through some kind of robust vetting process and delegate (retrospectively) their responsibility to decide who provides the strategic direction for the area in the next four years to Conservative party members, probably unaware that only a hundred or so were involved. I’ve asked Cllr Tierney if he has any more details of the public Q&A sessions and hustings which he has mentioned. If you see Sir Graham please encourage him to use our site to respond to the voters of Wisbech. Richard I have an unsigned reply to my mail regards policy of privatisation. So, Sir Graham or his team will answer mails I note with interest that Sir Grahams campaign manager writes to you “we feel it is most appropriate if you provide all formal candidates with the same set of written questions”. Like you I think the candidates should be open and responsive especially if one of their claims is that they will consult widely as Sir Graham does. 1. Which organisations and / or individuals are funding your campaign? 2. If self funding what are the sources of your personal income? 3. If representing a party how were you selected and what proportion of the constituencies party members took part in the selection process? 4. What experience do you have in the management or oversight of any public body or authority? 5. Overseeing the Police budget is a primary function what financial experience do you have? 6. What is your view on the need for cuts and how will you impose or fight them? 7. What is your view on the privatisation of the Police service as a whole or any of its subsidiary functions? 8. Given the proposed outsourcing do you or any of your family have any links with any of the companies likely to be bidding for this work? 9. During any part of your public life have you acted on behalf of any organisation other than the cbeen fundeddirectly, or indirectly, to support a private interest other than your constituents? 10. What is your view on the recent selection of the Police Crime Panel, and how does its decision to conduct its business in private impact on an elected Commisioner? 11. How much time will you give to the role of Commissioner? 12. What do you see as the priorities for the Police Service across the County? 13. To what extent should the police invest in prevention rather than reactive policing? 14. What do you understand to be anti-social behaviour and wha should be the police role in this area? 15. To what extent should the P&CC consider the protection of civil liberties in fighting crime? I am sure there are many other questions but this is a start. 9.During any part of your public life have you acted on behalf of, or been funded directly, or indirectly, by any organisation other than the constituents who elected you? Obviously it is his prerogative as a candidate to refuse to answer questions, as it is my prerogative as a voter to draw the conclusion that refusing to answer is pretty bizarre behaviour for anyone standing for election to a role that is supposed to be about making policing accountable to the public. You would think the offer of a channel through which to communicate his views would be welcome. Thanks for all your hard work in reporting this stuff, by the way, Richard. It appears Mr Bright is arrogantly (though perhaps reasonably given the way people vote) assuming he’s going to win the election. His Labour opponent has tweeted to ask if he’s not attending hustings to debate with him because he’s “shy” or because he’s “arrogant”. Sir graham bright just told the bbc that he is not bothering to campaign because he has already won Pcc in cambridgeshire. Sir Graham Bright may be well advised not to campaign. It is clear from his You Tube appearances and his rather stuttering explanations of his days activities that the Tory brand in Cambridgeshire would be best served without his interventions. If any other candidate is to beat him they will have to be rather more active than they currently seem to be. It will be a tragedy for democracy if Sir Graham Bright wins and is overseen by the Tory cabal that is the scrutiny committee. So no hustings in Cambridge and an appearance in the market square where he won’t engage in any dialogue that will make clear how he wll opertate once elected. The man is clearly a fool. Unfortunately given the consituency this man has every chance of being elected. Your video was very instructive let us hope that it is widely viewed. Too busy to get in contact? What’s he giving up to make time for this huge job then?? “Sir Graham said his priority was to “form a genuine partnership with the public in order to hold the police to account by setting a strategy with public input and effectively monitoring it”. But apparently if you pitch up with a camera asking perfectly reasonable questions, you’re “not the real public”. Seriously?? Maybe he’s the only public he’s keen on working with. I’m truly shocked at his reaction. Very unpleasant. What a supercilious buffoon Graham Write is. I emailed all four of my prospective candidates with questions on their manifestos. Only the Tory one got back to me, he called me on the phone for a ten minute chat. And at least he demonstrated to me that he knew what he was talking about . I take that the others did not, as they were not trick questions. I hope nobody votes for the Cambridge imbecile. The video of Sir Graham tells us more about the man’s character than we would otherwise have known. I thought that Richard Taylor was asking perfectly reasonable questions, and in a polite and respectful manner. Notso-Bright clearly had been briefed that RT was something called an ‘activist’, but I don’t see how that translates into ‘primadonna’. Bright’s remarks amounted to name-calling and was no way to deal with the situation. Here he was, in a public place, hoping to meet the public and put forward why they should bother to vote for him and he did not have the wit to engage with RT and try to turn the interview into a positive opportunity. The man was out of his comfort zone and gave the appearance that would prefer to have been in a nice warm boardroom surrounded by people who called him ‘Sir’, hung adoringly on his words of wisdom, and never asked awkward questions. We really do need a change in the voting system. With buffoons like Bright often being the only choice of candidates, with the only difference to help us distinguish between the unelectable and the objectionable being a red, blue or yellow rosette, we need the option to vote for ‘NONE OF THE ABOVE’. What a horrid little puffed up twerp. Such a high opinion of himself. Good on you RT – keep on asking those probing questions on our behalf. You would make a far better PCC than Notso. In the 2012 Police Plan for Cambridgeshire they quote a survey which suggests that just 1.4% are concerned about high levels of anti-social behaviour in their own area. Fear and anti-social behaviour were key and unsupported elements in Sir Grahams campaign – it seems that a sense of moral outrage has not left the elder Sir Graham Bright. What would Dear Bill think? If you wish to understand how Sir Graham bright reacts to moral panics then checkout his response to the film Vision of Ecstacy. This film is now classified by the board of control and freely available. Let us hope that he is more considered in his new role. one Conservative MP, Sir Graham Bright, called for the film negatives to be destroyed as part of the banning order. On Monday the 3rd of December an all day event was held at the Home Office for new Police and Crime Commissioners. It included a chance to meet the Home Secretary. Did our Police &Crime Cmmr Bright @pcccambs meet the Home Secretary yesterday? bit.ly/SBcj2R What, if anything, did he lobby her on? “I’m not discussing what I do when I go abroad”. If Mr Bright is not attending the Force Executive Board there will be no one there listening in on behalf of the public (the Police Authority chair used to attend). Sally Chidzoy has tweeted to say it was a two day trip – Monday and Tuesday – so Commissioner Bright missed his first Force Executive Board meeting too. This is astonishing; we really need to know what he was doing abroad so we can judge if it warranted missing two such crucial events. This was reported on the 9th of December with the headline: Police and Crime Commissioner Shows his Sensitive Side. It is good to see that Sir Graham Bright found time to open this exhibition, and reflect on his experience in China as PPS to Major. He is quoted as saying, “There is concern, particularly in the West, that China does have to come to terms with the fact that people should be free to have their own thoughts.” Well I guess that is a start. But given the systematic abuse of human rights in Tibet and towards Falung Gong in China freedom to have your own thoughts is probably the least of it. Chinese Premiers have regularly visited Cambridge would Sir Graham ensure that the right of protest is protected when the next premier visits.